When I accepted an invitation from the Israeli organization, Tevel B’Tzedek, to travel to Haiti a few months after the devastating earthquake in 2010 to do some teaching for their disaster relief team on the ground, little did I know that it would lead to one of the most fulfilling projects of my rabbinic career. The Israelis were doing amazing work under the most difficult circumstances, as Israelis have done all around the globe in similar situations. My contribution was to bring some Judaic context to the work taking place in one of the poorest countries in the world. powerfully with the story of the Israelites coming out of Egyptian enslavement and being led by God to the Promised Land. It reflects their deepest aspirations for themselves since Haitians have not only been victimized by natural disasters but by 100 years of political tyranny and a dysfunctional civil society. 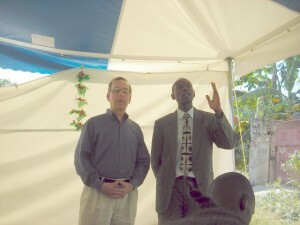 In several of my presentations to Haitians, my translator was a young minister named Johnny Felix. In his early 30’s and with a smile that can light up a room, Pastor Johnny founded a church and a school in Leogane, literally, out of nothing. I spent some time in his community and with the students in his school and felt that with a little help, Pastor Johnny could actually make a big difference in the lives of these children. Less than 50% of Haitian children go to any elementary school at all! Upon return home, I spoke about my experience from the bima of the congregation where I am the founding rabbi—Adat Shalom Reconstructionist Congregation in Bethesda, MD. I proposed that we undertake a Haiti Project with the primary mission of supporting Pastor Johnny’s NICL School which serves 170 children from K-6th grades. So as not to repeat the mistakes of so much post-disaster aid, the requirement was that families commit to five years of funding at a relatively modest level of $100/year. 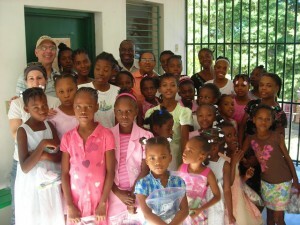 Adat Shalom’s Haiti Project is now going into its fifth year. Over 100 Adat Shalom households now contribute $100/year for five years which allows us to support Pastor Johnny’s NICL School in Leogane. As a result of this generosity we are able to send $8-9,000/year to fund scholarships for student tuition, equipment for the school and underwrite the school’s core budget. Pastor Johnny, who has almost single-handedly created the NICL school and a congregation in Leogane, said to me that Adat Shalom was sent to him by God. As much as that might hit our ears a bit strangely, there is no way to do the work that Pastor Johnny does day in and day out against overwhelming odds without such a “leap of faith”. In December 2014 I accompanied an Adat Shalom service mission to Haiti; it was our third mission in four years. It was also our largest delegation ever with seven young men, ages 15-25, and fourteen adults. It is hard to capture the power of the experience in words. During the days we worked at two venues. Having helped to build Lambi Village I in our 2011 and 2012 missions, we now broke ground for Lambi Village II. Each of these villages will house approximately 60 families that did not have homes to live in. Many have lived under tarps for years. We were so impressed that Grace International, the ministry that sponsors the Lambi Villages, pays as much attention to building character and promoting healthy family systems as they do to building structures to house Haitians. At Pastor Johnny’s NICL compound, we broke ground to build a mess hall for the school and we also created a vegetable garden that we dedicated and named Gan HaMazon, the garden of plenty. Many of the 170 students in the school are food insecure so we focused our attention on that aspect of community development. At both sites, we worked side by side with Haitians and we used that opportunity to gain insight into the challenges they face in their lives. In so many cases we walked away inspired by the dignity of the Haitians living in circumstances that are close to what would be our worst nightmare. The experience was also a deeply spiritual one for us. Every evening after dinner we gathered in the dorm at Notre Dame where we lived. We used the time to share highs and lows or our very intense days and then to enrich our experience by studying Judaic texts and values from a sourcebook that I put together specifically for our mission. The conversations were wide ranging. How can Americans be most helpful in a country where poverty, illiteracy and illness is so widespread? How can we help Pastor Johnny and the NICL school become self-sustaining? What are the ethical ramifications of our lives of privilege when compared to the deprivation that is the lot of most Haitians? On our last day, every person had a chance to share something they learned during our mission: a) about how to be most helpful to people in a developing country like Haiti; b) about Judaism and their Jewish identity; and c) about themselves. More than a few of the mission participants talked about the experience as “transformative” and “life changing”. As a rabbi our service missions represent the very best of what we can and should be doing as a Jewish community. The participants became a tightly bonded team during our challenging days on the work site and we became a family in our “down time” at the dorm. With each passing day we became more inspired to give of ourselves to help those who have so little but who live their lives with great dignity and with deep faith. Finally, we took great pride in “walking the talk” of Torah. We weren’t just talking about Jewish values; we were living those values every day. In the sermon I delivered at Pastor Johnny’s church on Sunday morning I said that despite the differences in nationality, race, religion and socio-economic status that separate us and the Haitians who were our hosts, three things tie us together. Both communities are faith communities committed to chesed, acts of lovingkindness; tzedek, acts of justice; and shalom, acts that advance spiritual wholeness and peace. The Haiti Sermon from Adat Shalom on Vimeo. Visit Adat Shalom: Haiti Project for more information or to make a donation.